“From my time as a priest ministering in Derry, I know well at first-hand how the local Foyle Search and Rescue volunteers work selflessly, and in their own free time, each week to help those who are vulnerable and in need. Critically, the volunteers save human lives ” – Archbishop Eamon Martin (August 2018). A great gesture from Pope Francis is how the Mayor of Derry city, John Boyle, described the gift to Foyle Search and Rescue of one of the cars used by the Pope during the World Meeting of Families (WMOF) 2018. He said that the car will mean a lot to Foyle Search and Rescue members in their efforts to keep people safe. Father Tim Bartlett, Secretary General of the WMOF2018, travelled to Derry on Tuesday (5 February 2019) for the official handover of the car and spoke of the Pope’s wish for the vehicle to be used daily to help others. Spokesman for Foyle Search and Rescue, Pat Carlin, said the charity was astounded when it had been nominated to receive the papal car. “We are absolutely delighted. We intend using the car for education and operational purposes. Archbishop Eamon Martin said he thought of us because of the work we’ve been doing over the last 26 years. There’ll be many benefits for us, not least financial. It takes £135,000 each year to run Foyle Search and Rescue and we’re currently looking at our transport,” he said. He added that the car is worth more than £25,000, so they no longer have to worry about raising that amount of money this year. The Skoda Rapid estate was one of two cars used by Pope Francis during his visit to Dublin and Knock last August and which became a familiar sight on TV screens as he visited various locations. Foyle Search and Rescue volunteers on a training exercise. (Pic Patrick Sadowski/Foyle Search and Rescue). 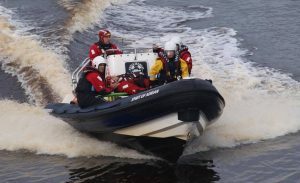 Foyle Search and Rescue provides suicide prevention and rescue operations in cooperation with the police and the RNLI. It was set up in 1993 in response to the high number of drownings in the River Foyle, which at the time came to 20 in as many months. Some deaths were the result of misadventure and others involved people who wanted to take their own lives. Volunteers patrol the river after dark and in the small hours of the morning and they reach out to anyone they find in difficulty. Their new car’s original diplomatic number plate SCV 1 – Stato della Citta del Vaticano (Vatican City) – was replaced by the registration number XUI 2066, in advance of the official handover. Local media reports suggest that the original (Vatican) number plate is now on display at the local Skoda dealership, John Mulholland Motors, Campsie, Co. Derry. 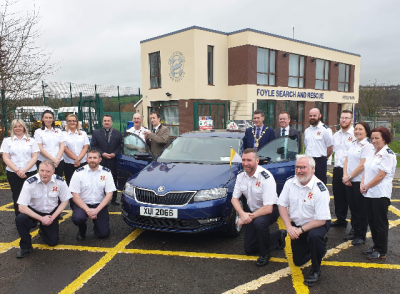 John Mulholland himself was present at the handover of the vehicle, as were members of the Foyle Search and Rescue, Mayor Doyle and Archbishop Martin. Raymond Leddy, Head of Marketing and Product, ŠKODA Ireland, said the company was delighted to have been “a small part of history” in supporting Pope Francis on his visit to Ireland. He offered best wishes to Foyle Search and Rescue.